In most cases (but not always), the best prices for Super Bowl tickets are available well in advance of the game, especially before the opponents are determined. The Super Bowl is simply the biggest sporting event there is. If you go to this game, you will remember it for the rest of your life. The demand for tickets to the Super Bowl greatly exceeds the NFL’s ability to accommodate the majority of fans interested in attending. Most tickets are made available through the two teams competing in the game, and to a lesser extent through each of the other NFL teams. Remaining tickets for the general public are made available through a random drawing. There is no other means for the general public to purchase tickets. Although many people refer to it as a lottery there is no charge to enter and if you are chosen you will have the opportunity to buy a pair of SuperBowl tickets at face value—typically about $400 each. Entries for the random drawing are accepted between Feb. 1 and June 1 of the year preceding the game in question. All entries must include name, address, city, state, zip code, phone number and an email address, and must be sent via certified or registered mail. Winners of the drawing are able to purchase two tickets to the game. All entrants will be notified of their status in the fall. Please note: Only one request per address is accepted. Duplicate requests are disregarded. Type your Super Bowl ticket request, especially if you have poor penmanship. Make sure to request two SuperBowl tickets to the Super Bowl you wish to attend. Don’t forget, your request must be sent via certified or registered mail. Remember that duplicate requests will be discarded, but there is no rule against entering all of your friends and family in the Super Bowl ticket random drawing!! Want to be reminded when the drawing begins? Try remind4u.com, it’s Free! Find friends, family members or coworkers who are season ticket holders for one of the teams playing in the Super Bowl. They have the best chance at tickets. Contact anyone you know who is a season ticket holder, they may have an opportunity to purchase tickets and never follow up – stay on top of it for them and get a ticket for yourself in return. Check the tickets section of the team's website to see if tickets are still available. This is very unlikely, but sometimes there are lotteries or other ways of getting tickets that go overlooked. It never hurts to check with your team. Visit an online ticket marketplace like StubHub and click on Super Bowl tickets to see a wide selection of tickets and prices for the game. Sites like this will probably be your best chance of scoring 50 yard line seats, but be prepared to pay up! Consider eBay, but be very careful when dealing with such a large-dollar transaction as Super Bowl tickets. Make sure to only deal with reputable sellers and understand in advance how and when you will get your tickets. Beware of fraudulent tickets and the hassle of bidding for tickets. Also make sure you can pay safely. Often a ticket marketplace site like StubHub that offers a 100% guarantee on transactions can be the best mix of good prices and safe ticket purchases. Super Bowl tickets are expensive. Even face value tickets (almost impossible to find) usually start at $400 per ticket for nose bleed seats. Most Super Bowls in recent years have had open market ticket prices starting around $2000 and going up from there. Tickets 101 features reviews, coupons, and more suggestions on buying tickets from online ticket brokers and marketplaces. Review the helpful ticket-buying strategies and safe practices before buying tickets online. The majority of Super Bowl tickets (about 75%) are distributed to the NFL teams with each of the participating teams splitting approximately 35% of all Super Bowl tickets. All teams not playing in the Super Bowl will receive just over 1%, and the team hosting the Super Bowl receives about 9% of the Super Bowl tickets. The remaining 25% of SuperBowl tickets are controlled by the NFL and are distributed primarily to NFL affiliated companies, the network broadcasting the Super Bowl, corporate sponsors, media, VIPs, charities, fans and the Host Committee to package with sponsorships. 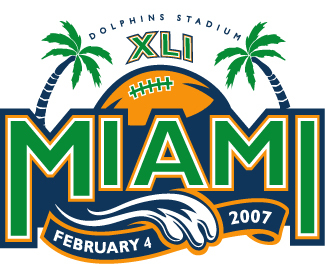 Site: Dolphin Stadium - Miami Gardens, Fla.
Other Super Bowl host cities: New Orleans (9: Tulane Stadium 3, Louisiana Superdome 6); Los Angeles (7: Los Angeles Coliseum 2, Rose Bowl 5); Tampa Bay (3); San Diego (3); Atlanta (2); Houston (2); Arizona (1); Detroit (2: Pontiac Silverdome 1, Ford Field 1); Minneapolis (1); Stanford (1); Jacksonville (1). Home team: NFC Champion will wear its choice of jerseys. Who makes Super Bowl Trophy: Tiffany & Co. of New York. Cost of Super Bowl rings: League pays for up to 150 rings at $5,000 per ring (plus adjustments for increases in gold and diamonds). League also pays for 150 pieces of jewelry for the losing team, which may not cost more than one-half the price set for the Super Bowl ring. Host city economic impact: Super Bowl XL generated a total economic impact in Detroit of $261 million, according to a study commissioned by Detroit Metro Convention & Visitors Bureau. Super Bowl XL TV audience: Last year's game was watched by 141.4 million viewers. The 10 most-watched programs in TV history are all Super Bowls!